In the 21st century, many branches of industry are connected to the oil topic. Due to the fact that oil is finite resource it is going to be depleted in the near future (Tsoskounoglou et al, 2008). Consequently, as time passes, the price for oil will grow and that can result in increase of price of petrol because of the fact that petrol is the oil product. On the other hand, huge amount of petrol – using vehicles produce emissions of pollutants like CO2, CH4, NOx and SOx (Yang and Ogden, 2007). This has impact upon economic and environmental issues. That’s why alternative fuel is needed to be implemented into social use and hydrogen fuel could be used for that purpose because of its efficiency and sustainable ways of obtaining. This essay is going to discuss whether hydrogen is a feasible replacement for petrol or not through looking at different aspects of the system, including one particular way of obtaining, infrastructure of delivery to the refueling stations and ways of on-board storing of the hydrogen fuel. Figure 1; Source : Tsoskounoglou et al, 2008. 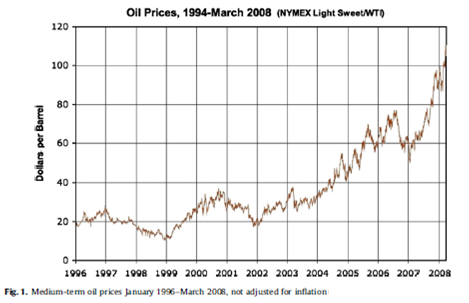 As it was said, demand would exhaust all available oil supply in roughly 23 years (Smith, 2012). Therefore, all industry, which is linked with oil, may stop working in the near future. As a result, huge economic disaster may occur and a lot of people possibly will be fired. In addition, according to Midilli (2008) using fossil fuel in different aspects continues hazarding the global sustainability, air pollution level keeps increasing and emission from petrol being burned is playing great role in that process. Figure 2; Source : De Vlieger, 1997. These numbers represent the amount of grams of emission a vehicle makes per kilometer and the average amount of emission for normal driving is 33.88 grams per kilometer. 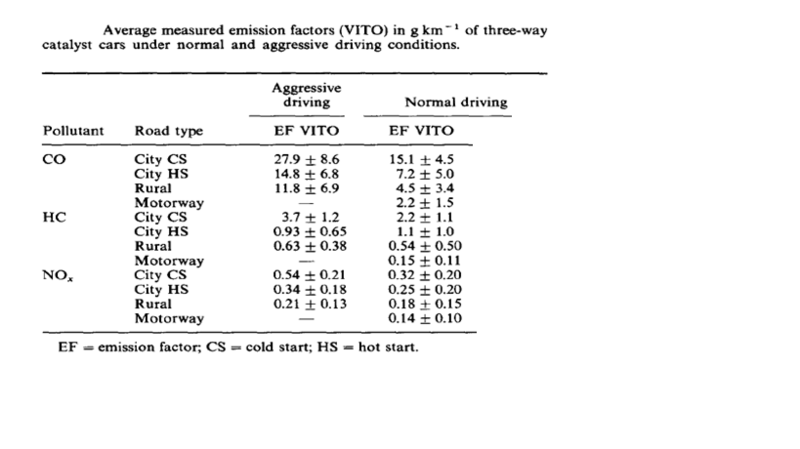 It seems that it is a small number, but there is huge number of cars around the world and during aggressive driving a vehicle emit more exhaust, so the total exhaust level is vast (De Vlieger, 1997). The components of exhaust lead to many respiratory diseases like cancer, because the petrol exhaust is considered as cancerogenic; in the other words, it causes cancer. However, the emissions amount may be reduced by decreasing the percentage of fossil fuel in the components and introduction of alternative sources of energy, like hydrogen (Midilli et al, 2008). It has the highest gravimetric energy density in comparison with all fuels; it is exactly 142 MJ/kg. However, at normal conditions, hydrogen exists in form of gas and its density is low, approximately 12.7 MJ/m3 (Yang et al, 2007). Therefore in order reach high energy output, hydrogen should have higher density and there are 3 ways to store the hydrogen with satisfying that requirements. However, hydrogen has some negative properties too. For instance, hydrogen has very low ignition energy, particularly 0.02 mJ (Health and Safety Laboratory, 2010). In the other words, a little spark is enough to create an explosion, so this fact makes it very dangerous. Exergy is defined as the “maximum obtainable potential of work of an energy or energy flow in relation to the reference environment” (Midilli, 2008). By means of exergy the characteristics of a fuel or a system can be explained. Sustainable energy sources are required because of limited access to fossil fuel and damage to the environmental from emission of fossil fuel being burned (De Vlieger, 1997). Hydrogen, as a sustainable energy source, is predicted to play significant role in replacing fossil fuel, because it is more exergetically efficient in power generation systems (Midilli, 2008). However, in this century, energy for hydrogen production, storage and transportation is being obtained by using fossil fuel, so another sustainable source of energy, like wind energy, should be applied to reach full sustainability of hydrogen fuel (Midilli, 2008). There are many ways to obtain hydrogen from bio-mass and water. Many of them are environmentally friendly, but not efficient enough (Straka et al, 2012). Only one method of obtaining hydrogen will be presented in the essay and it is called “water-gas shift”. The idea of the method is to combine carbon monoxide with water to form hydrogen molecule and carbon dioxide (CO + H2O CO2 + H2) in the occurrence of catalysts like Cr2O3 or Fe2O3 and for the best result the reaction should take place firstly in high and then in low temperatures. In this reaction almost 90% percent of carbon monoxide conversion occurs. The rest amount of it may be transformed into methane (CH4) by reaction called “methanation” (CO + 3H2 CH4 + H2O +energy and CO2 + 4H2 CH4 + 2H2O + energy). The entire processes take place in one reactor and the outcome differs with the catalysts used during the reactions. Moreover, the rest components like CO2 and CH4 can be transformed back by means of reaction called “partial oxidation” (CH4 + O2 CO + 2H2 and CH4 + 2O2 CO2 + 2H2O) (ibid.). In addition, according to Straka (2012) hydrogen is required to be purified and there are 3 ways to do it. For instance, it can be purified by pressure-swing absorption, cryogenic distillation and membrane technologies and apart from all the most beneficial method is pressure-swing absorption with efficiency more than 99%. Straka (2012, 11570) reports that the water – gas shift reaction is “the basis of the global industrial production of hydrogen from natural gas by steam reforming”. Hydrogen stations play key role in distribution of any fuel because it is place where end users, in terms of vehicle owner, will interface the infrastructure system and there are 4 ways to supply the refueling station with the hydrogen fuel. They are: truck delivery of liquid hydrogen, truck delivery of high-pressure tanks, through pipe system from a near - standing centralized facility and the on-site production (Yang and Ogden, 2007). The stuff needed on the stations depends on the type of supplying the station. However, there is some equipment that is common for all types of the refueling stations (ibid.). For instance, storage vessels, safety equipment, mechanical equipment, electrical equipment and compressor are present in most stations. The system of delivery of the compressed hydrogen through trucks is simple and commonly used. However, the energy density of compressed hydrogen is low in comparison with liquid hydrogen, so the method is used for smaller – scale processes, where it is more beneficial to use it rather than delivery of compressed hydrogen through pipelines and liquid hydrogen through truck (ibid.). Hydrogen delivered using this way would be produced at large centralized facility and reduced in volume in order to reach pressures matching the tube trailer, which are usually around 2400 psi (ibid.). Mainly, there are two ways to fill the tubes with hydrogen. In particular, it can be filled either by means of reciprocating piston or diaphragm compressors. First one works like an automobile engine. In the other words, reciprocating piston compressors consist of a cylinder with two valves; through the upper one hydrogen gas gets in the cylinder, then is pushed by piston, which is hold by crank and connecting rod. As a result, the inside volume of the cylinder shrinks and compressed hydrogen goes through delivery valve to the tube. However, during the process some impurities like lubricant can get into the hydrogen gas. In the second case, diaphragm compressors can have some advantages in terms of purity of gas, leakage. Mainly, the reason of that is its special structure ad principle of working, which is presented below. However, its cost is higher in comparison with the reciprocating piston compressors. Figure 3: Reciprocating piston hydrogen compressor. Source Straka et al, 2012. Figure 4: Diaphragm hydrogen compressor. Source: Straka et al, 2012. Table 2. Source: Yang and Ogden, 2007. Obviously, the producing on stations does not require this stage. Similarly to transporting, storage needs some investments. Eventually, the final stage of the system is distribution the fuel to the car owners. In order to achieve this, dispenser are required, which, as H2A (2005) reports, have the price of $26,880 per unit. The second way is delivery of liquid hydrogen via trucks. Converting hydrogen gas into liquid form significantly increases the volumetric density of the fuel and more energy can be transported par truckload. Usually, in liquid hydrogen production system, there is a liquefaction plant near to hydrogen production plant. In addition, hydrogen trucks are required to transport the fuel to the plant and to the refueling stations with hydrogen storage. In contrast with the previous system, after being transported liquid hydrogen is stored in one large container and later using a pump it is moved to another container connected to dispensers for filling but in gaseous state. 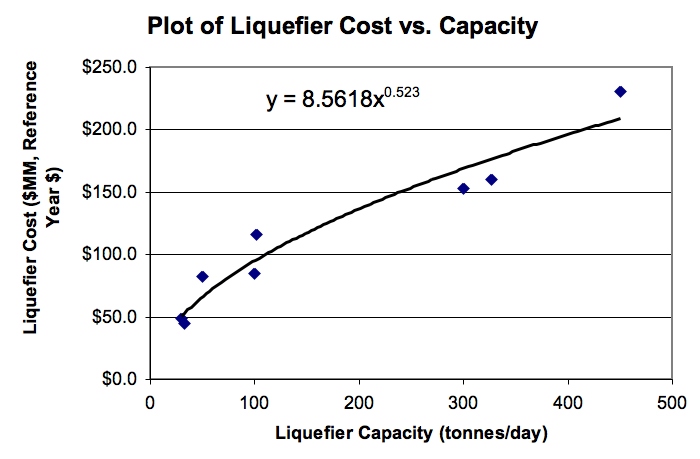 The assumptions of liquid hydrogen and relationship between costs of liquefier with its capacity are listed in Figure. Table 3. Source: Yang and Ogden, 2007. Figure 5. Source: H2A, 2005. NRC (2004) reports that the capital cost for liquefiers of capacity of 300 tons per day is $112,826,412 and it is predicted to decrease by half in the future. In addition to the capital cost of the liquefiers, the operating cost, which is 4% of the capital cost, exists. The rest installed costs and the equipment are given in the table 3. Table 4. Source: H2A, 2005. However, despite the fact that the hydrogen fuel is more environmental friendly, different regions of the country use different mixes of power plants to provide their electricity, so the emissions of pollutants takes place during the actions of the systems. In addition, because of the usage of trucks for delivery, emissions related to the burning of the diesel fuel come out. Pipeline delivery is an economical method of transporting large volumes of compressed gases and liquids by means of pressure differential from origin to destination. The system makes sense in the presence of widespread utilization of hydrogen using vehicles, because the capital investments for pipeline construction and operation hamper its usage for small quantities of hydrogen. Actually, the system is similar to the structure of natural gas pipelines. Hydrogen has low viscosity in comparison natural gas, so the frictional losses and power required to move the gas through the pipe are low too. However, pure hydrogen causes “embrittlement” of steels under pressure cycling. As a consequence, pipeline becomes inapplicable in a short period of time (Mohinder, 2000). Therefore, special steel is required to use in building the pipelines, which will cause an increase in cost of hydrogen pipelines (Parker, 2004). The total installed pipeline costs can be described by the equation $(1869*D2 + 300,000) per kilometer for rural areas and $(1869*D2 + 600,000) per kilometer for urban areas (NRC, 2004). Pipeline hydrogen equipment installed costs are given in the table 4. Table 5; source: H2A, 2005. 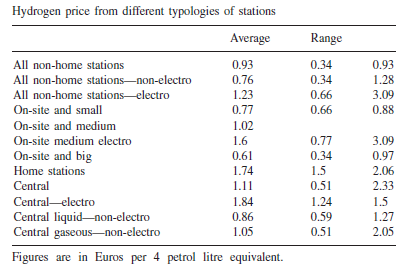 Hydrogen prices from different typologies of station are listed in the table below. From that table it can be said that the overall average of the costs is 1.12 of the price of 4 petrol liters (Mulder and Girard, 2004). Table 6. Source: Mulder and Girard, 2004. One of the challenges of this type of delivery of hydrogen is that large number of pipelines connecting to a number of stations is required. In conclusion, the type of delivery offers the lowest energy use and probably the lowest cost transportation, distribution and dispensing pathway. Despite its large capital requirements, the hydrogen demand is able to reduce it per unit of hydrogen dispensed. After producing the hydrogen, it must be stored and transported somehow. At the present time there are 3 ways to store hydrogen. The first method is called “high-pressure tank system”. The structure and charge-discharge ways of the system is simple. There hydrogen gas is stored in pressure-resistant allows of materials under high pressure; in addition to this it charges and discharges like simple gas cylinder. In general there are four types of cylinders: V1, V2, V3 and V4 cylinders. The differences between them are in the composition materials and the wall thickness. V3 and V4 tanks are able to be under higher pressure than the first couple, which is used to store natural gas. Hence, V3 and V4 tanks are used to store the hydrogen more commonly, because the hydrogen vehicle applies higher pressure than natural gas vehicles, which is usually compressed to 20-25 MPa. Recently, there is a tendency to increase the pressure to 70 MPa in order increase hydrogen amount and, as a result, the vehicle range. 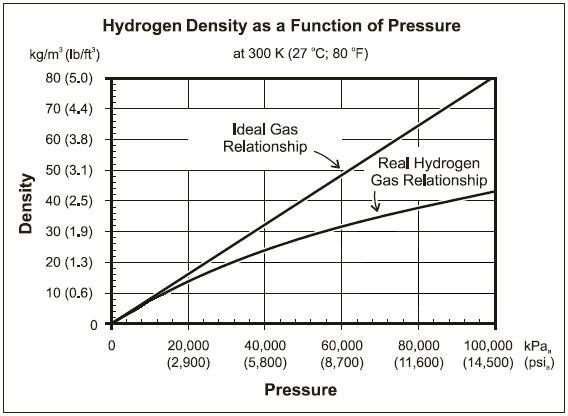 However, since the relationship between the amount of the hydrogen and pressure becomes un-linear at higher pressure, double pressure will not lead to double increase in capacitance. The optimization of winding type and materials used has had effects in 65% more hydrogen storable for the same vehicle. Despite the fact that volume of high–pressure hydrogen tanks is quite large and they are unable to be shrunk more due to physical properties, it can be compromised with vehicle’s shape to increase the range of it. Figure 6. Source: Lanz, 2001. Hydrogen can exist in liquid form when the temperature reaches 20K degrees at atmospheric pressure, which is equivalent to -253 oC degrees. It is attractive way to store hydrogen because liquid hydrogen has high density, so huge amount of the fuel can be hold on board. As a result, the range of vehicle is large too. In addition, it can be easily transported. Therefore, this type of hydrogen storage is very promising from the point of infrastructure. The liquid hydrogen tank is a complicated system with multi-layer insulation to prevent heat exchange between the tank and environment. However, tank is not perfect, so a few percent of hydrogen evaporates per day. In addition, the production of the fuel requires extra energy consumption, but, as it was said, the easiness of the storage and delivery covers all these things. 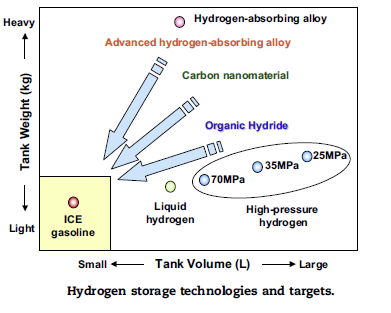 Hydrogen – absorbing allow tank has advantage of storing hydrogen more dense than liquid hydrogen, thus the tank can be built and has attributes of reversible hydrogen charge and discharge capability. However, the tank type has a low gravimetric density. In the other words, the ratio of the hydrogen weight and the tank’s weight is low. In addition, tests showed that there is usage of big amount of heat while absorbing the hydrogen. Moreover, the tank’s discharge amount is low at low temperature. The overall comparison between the types of hydrogen storage in terms of weight of tanks and their volumes is given below. According to the chart (Hirose et al, 2008) the most appropriate types of storage are liquid hydrogen tanks and 70 MPa high-pressure tanks. In spite of the fact that hydrogen-absorbing tanks have the approximately the same volume as the first two ones, they are too heavy. To conclude, this essay has shown that hydrogen fuel is a feasible replacement for petrol, by analyzing its most common way of obtaining, infrastructure and methods of on-board storage. Hydrogen has the highest gravimetric density, but it has very low ignition energy at the same time; that makes it dangerous. However, in order to prevent emergency situations high-pressure tanks are being used. Hydrogen can be produced from some pollutants such as carbon monoxide and carbon dioxide. After being produced there are three possible ways of delivery of the fuel. All of them have some advantages and disadvantages, but it can be said that it would be beneficial to use compressed and liquid hydrogen truck delivery method in the beginning and then mainly switch to the piped delivery method when demand would be large enough to cover the investments of the last one. The following step is the storing on-board. There are mainly 3 ways to store hydrogen. The first way is to keep compressed hydrogen in special tanks; the second is to keep hydrogen in liquid state and the last is to store it in terms of hydrogen-absorbing allow tank. The average price of hydrogen is a bit higher than petrol’s price. Taking the whole picture it can be said that hydrogen is a new perspective source of energy and it can be widely used in vehicles as a fuel instead of petrol.